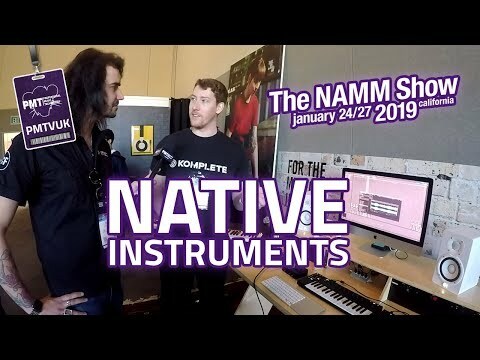 The Native Instruments Komplete Kontrol M32 is a mini keyboard controller that opens up the world of NI's Komplete Library of VSTs, Instrume.. The Native Instruments Komplete Kontrol M32 is a mini keyboard controller that opens up the world of NI's Komplete Library of VSTs, Instruments and Effects at an affordable price. Navigating your plug-in library, scrolling through presets and tweaking synth parameters has never been this good on a compact MIDI Keyboard no bigger than your laptop. A perfect entry-point into the Native Instruments ecosystem for new starters, or for seasoned musicians that want a travel-friendly controller with all the trimmings. KK M32 features 32 synth-action micro keys, OLED display, touch-sensitive controls and the same touch-strip style controls as its bigger brothers. By condensing the immense power and revolutionary workflow of Komplete Kontrol S & A Series keyboards into a bite-size version, M32 is the ultimate take-anywhere travel companion for music producers and songwriters on the move. 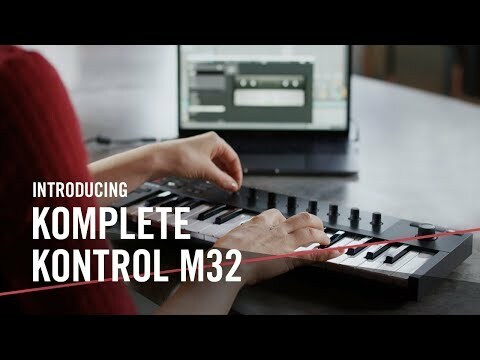 M32 also comes ready shipped with a collection of Komplete instruments and effects, Komplete Kontrol library software, MASCHINE essentials and Ableton Live 10 Lite. A stunning software package worth the price of admission in itself! The Native Instruments Smart Play system is great for music producers that aren't fully trained in music theory. Under the hood, Komplete Kontrol M32 features hundreds of Western, Eastern, Jazz, Contemporary and World Music scales that instantly keep you in the right key, whatever notes you press. Play complex chord progressions with one finger, or map any scale to white keys only with 'Easy' mode. Each of the Native Instruments Komplete instrument presets have been painstakingly tagged with unique identifiers, depending on the instrument, mood, timbre or type of sounds. This allows for easy access and browsing via the M32 encoders - scroll through particular types of sounds quickly, and spend less time on your mouse and keyboard. Auditioning sounds is super fast, and speeds up the creative process whilst you're working on ideas! The beauty of the Native Instruments Komplete Kontrol environment is that your keyboard comes auto-mapped to thousands of Native Instruments Plug-Ins, straight out the box. No more time wasted spent manually mapping to your favourite plug-ins. Just plug and play. Komplete Kontrol Keyboards also come pre-mapped to hundreds of NKS-compatible Plug-Ins from many of the world's leading soft synth brands like Arturia, Rob Papen, plus many more added each week. KK M32 slots straight into your pre-exisiting plug-in ecosystem! Komplete Kontrol M32 includes a collection of KOMPLETE instruments and effects, KOMPLETE KONTROL software, MASCHINE Essentials (full MASCHINE software plus 1.6 GB MASCHINE Factory Selection of samples, one shots, loops, and instruments), plus Ableton Live 10 Lite. Simply register your new hardware to your Native Instruments account, and it's all yours. You can add to your sample library or plug-in collection via Sounds.com - a brand new platform spearheaded by Native Instruments to put affordable, high-quality sounds in the hands of the music production community.